Vintage, Waterford Crystal Bowl, Tyrone Pattern WATTYR, 8 1/4" Diameter, Serving or Salad size, Footed Pedestal , Circa 1960's time frame. 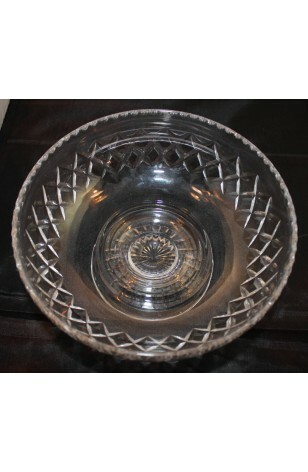 This is a Beautiful Vintage, Cut Crystal, with Footed Pedestal, is a Serving or Salad Size Bowl (8 1/4" in diameter), in the Tyrone Pattern #WATTYR, by Waterford Crystal. Our Internet Research Team found it to be made in the 1960's. It has a Criss-Cross Pattern, with a Star Burst/Daisy Pattern as well. The Rim of the Bowl has a Crimped Pie Crust, or Thumb Print like Pattern.